If push came to shove, if I had to choose between my life and allegiance to Christ, would I finish with the same flourish? Would the way I died shine light on the spiritual darkness of those who yelled for my life to end? He was 86. The year was around 160 AD. The Bishop lived in Smyrna, a city devoted to Rome, where those who didn’t believe in the Roman gods were vilified as “atheists.” Greatly revered as a teacher and church leader, he was the last surviving person who knew one of Jesus’ original apostles–in this case, John. When the arresting party came to his house, he gave them food and drink, and asked permission to pray before leaving to meet the proconsul. For two hours he poured out his heart to the Savior while the soldiers watched and listened. The way He died provided an even stronger testimony of faith than the way he lived and what He taught. During his sermon, our pastor recently recounted Polycarp’s dialog with the proconsul. Because I knew the details of his martyrdom, as soon as he said the name “Polycarp,” tears cascaded down my cheeks. 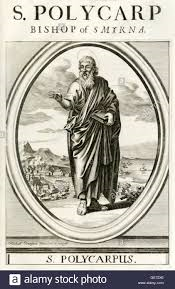 The story always spawns tears, perhaps because I admire Polycarp’s bold faith and yearn for just a smidgen of it as a Christ-follower. Remembering how Polycarp died inspires the following thoughts in me today. *”Old age, bring on your creaking joints, the escalation of fatigue, the worsening back pain, the more frequent visits to the doctor, and the higher prescription costs! *”Satan, bring on your attacks! Your ramped-up temptations suggest that I’m a bigger-than-ever threat to you. The intensity of the warfare, your relentless assaults that try to thwart my ministry, just goes to show how important my teaching and writing is. Ironically, your assaults encourage me! *”Depression, bring on your episodes of darkness and despair! “My emotional frailty forces me to cling more desperately to my Savior. When I am weak, then He is strong (2 Cor. 12:9-10). When I accomplish something for the Lord, those who know me and my weaknesses give God the glory instead of me. Others know me too well to attribute the outcome to me. They figure the only explanation is that God did it (2 Cor. 4:7)! How should you complete that sentence today? Don’t complete the sentence glibly. We don’t exult in victories without bruises from the battles. Yet when a victor from church history speaks, will we listen?